What can one say about the Grand Canal? This is the greatest avenue in the world! A little strange it may be, a major street made out of water yet lined with some of the greatest buildings on earth, yet this is an enchanting place. 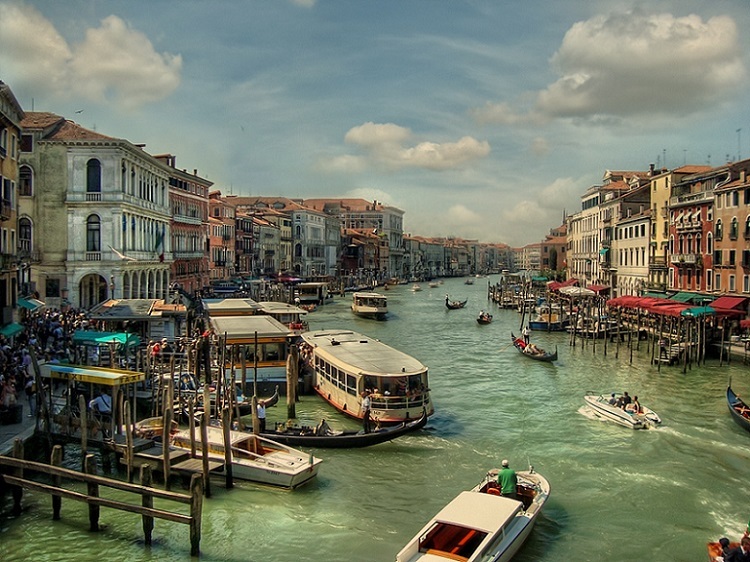 The Grand Canal is way more impressive than any of the other canals of Venice. It is on a much grander scale and far larger than any other, two miles long (3.5 km) and at its widest point over 350 ft (90m) wide. This was the place to live in centuries past and in fact this is still the address to have. Any merchant who made it in the world of business had his home here. Most of the beautiful buildings along the canal originate from this quest by the Venetian rich to outdo the neighbor's place next-door... and how little things have changed today. Styles of houses along the canal are varied. Some of the earliest are the old Fondaco houses – the homes of the first merchants which included a warehouse for their trading businesses. In later centuries these were followed by buildings of Byzantine style and then once the influence of the Ottomans had declined Gothic, Baroque and Renaissance architecture predominated. Little has changed over the last two or three hundred years, you'll see pretty much the same thing someone three hundred years ago would have seen. It was in the 12th century that the first bridge over the canal was built. This was replaced in the 16th century by the famous Rialto Bridge which remained the only bridge over the Grand Canal until the 19th century. Still the best way to see the canal and fairly cheap too is to take a water bus – known as a vaporetto in Italian. The number one bus does the route and it provides a stunning ride through the centuries, just make sure you take your camera along. If you would prefer to enjoy the canal in a little more style than the public bus/boat offers then this is the answer. Need a hotel in Venice? I'd not hesitate to recommend these.